Send this perfect gift of Gorgeous Autumn Beauty Bouquet in a Glass Vase especially for him/her. This Bouquet is created with stunning fresh Flowers perfectly paired with 6 Pink Roses and 8 Gerberas in a Glass Vase. Order for delivery of Fragrant Embracing Pureness Flower Arrangement to your special one. 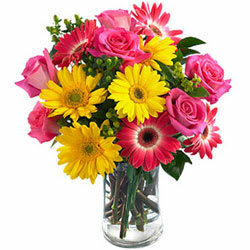 This Bouquet is adorned with 5 Gerberas and 15 Pink Roses displayed in a Glass Vase. Order for delivery of Fragrant Embracing Pureness Flower Arrangement to your special one. This Bouquet is adorned with 5 Gerberas and 20 Pink Roses displayed in a Glass Vase.